How much does it cost to paint a house? Prices for painting. 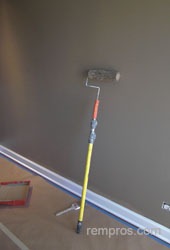 On average, cost of basic single coat of paint application on walls and ceiling in one 150 ft2 bedroom vary from $125 to $165 excluding paint expenses and actual prices will be determined by a number of factors. Typically painting interior of three bedroom 2,150 square feet house will be estimated at $3,050 - $3,450 for labor only. Regular closet 24" x 72"
3 Painting cathedral, vaulted, tray and cove ceilings will be charged at 60% - 85% higher rate for one color of paint application. Combination of two or more colors on a coffered ceiling will result in double or triple the labor cost. It is doesn’t matter where it is flat finish or gloss - the cost of painting a house won’t be quoted based of paint sheen. But labor expenses might be different whether if you will use water or oil based paint. Many wood elements in the room like moldings, baseboards or doors can be painted using oil-based paint what might increase the labor cost. $0.50 - $0.65 / Ln. Ft.
$0.60 - $0.75 / Sq. Ft.
How much did you spend or think it is a fair price to pay for house painting?